Our test diesel-powered 328d arrived in Sports Wagon guise and with AWD. With options the compact BMW came to $50,825 including the $925 destination charge. BMW really has the “sporty premium compact” field covered. Not only is the venerable 3-Series offered as a traditional sedan, but new for 2014 are the Gran Turismo hatchback along with a full-fledged wagon. (There’s also a coupe and convertible, but those are now under the 4-Series designation.) The 3-Series continues to be available with rear- or all-wheel drive, with engine choices that include a turbo 4-cylinder, a turbo six-cylinder, and a new turbodiesel 4-cylinder. What we tested might well be the most intriguing of all the combinations: an all-wheel-drive wagon with the new turbodiesel engine, the last of which qualifies it for a “328d” badge. 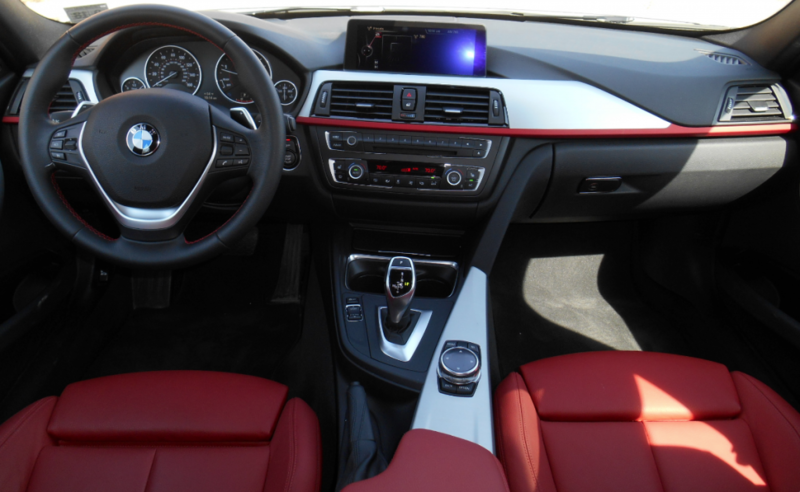 BMW’s refined cabin is nicely appointed, though materials quality is only average for the class. One of the more interesting comparisons is between the “normal” gas-powered 328 and the new 328d. First, there’s power: Though both displace 2.0 liters, the gas engine makes 240 horsepower and 255 lb-ft of torque, while the turbodiesel comes in at 180 horsepower and 280 lb-ft of torque. That would seem to give an edge to the gas model, but the diesel proved to be a torquey little wonder that provided perfectly adequate pull. There’s typical turbo lag from a standing start – as is the case with the gas-turbo four — but power comes on quickly, and is immediately present when the throttle is stabbed at speed thanks in part to responsive downshifts from the 8-speed automatic transmission. The final competition is cost. This is where many diesels (and hybrids) lose some of their appeal, because their higher price takes an awful long time to recover in fuel savings. Not so much here. At least in base models, the difference is just $1300, which isn’t much of a premium when you’re already talking about a car that starts near $40,000. But back to the test car itself. The short take is that the drivetrain suffers only from a little diesel clatter at idle and a start-stop system that isn’t as smooth as the best. 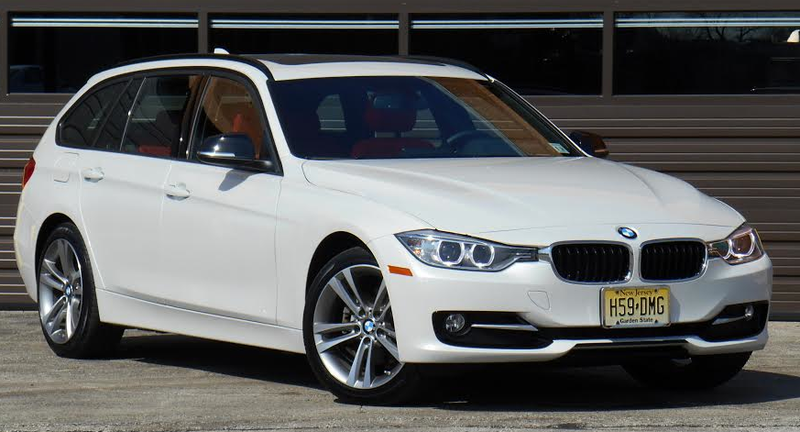 Ride and handling strike BMW’s traditionally attractive balance, and the wagon body style offered a desirable dose of utility that’s missing in sedans. And although winter has finally been fazed out around here, the all-wheel drive would have been supremely attractive two short months ago, and makes this car a rather unusual – and desirable — combination in the automotive world. 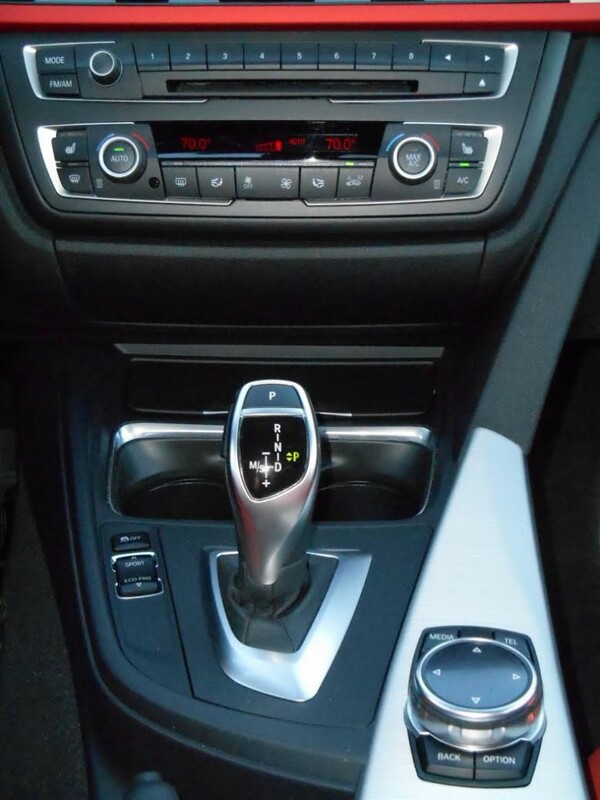 The iDrive knob (lower right) is the heart of the 3-Series control system. Rick and Tom agree the system has improved over time, though Rick still longs for conventional switchgear. In more detail, the interior is dressed in generally high-quality materials (though the “soft” door tops are due more to panel flex than padding), and the driver enjoys fine all-around visibility (though the sun visors don’t extend when rotated to the sides, leaving some of the window uncovered). An oddity here is that despite a $43,000 base price and $50,000 sticker, our test car lacked both rear obstacle detection and a rearview camera – even though it already had an 8-inch dashboard screen. Interior storage could be better, as the usually “big” compartments – the glovebox and console box – are decidedly not, though they’re augmented with a small forward bin, a left-side dash bin, two cupholders, and map pockets. 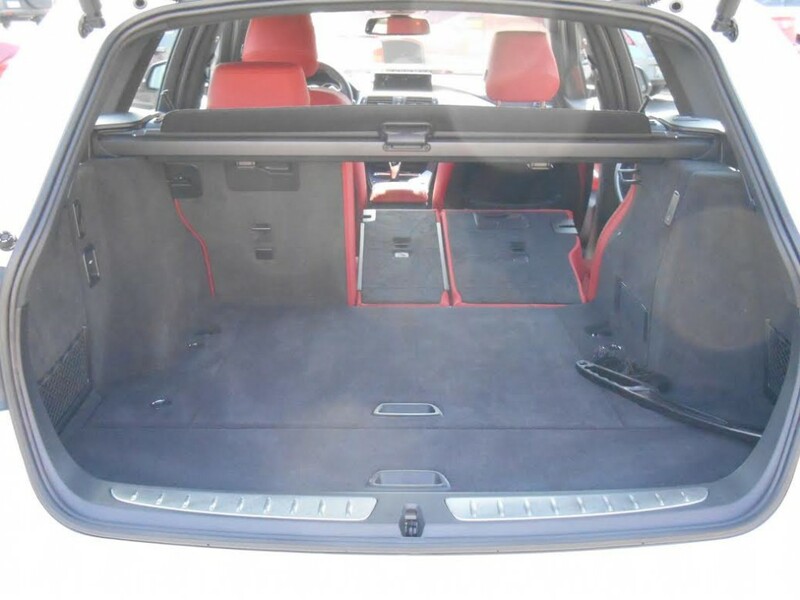 Conversely, cargo storage is quite impressive, as the load area in back is rather wide at the rear, there’s a good amount of underfloor storage, and the seat backs fold level with the load floor and nearly flat to create a usefully cubic cargo area. An issue that confronts most cars is this class is a complicated control layout, and the 328d is no exception – though it’s a bit better than many. BMW’s infamous iDrive has gone through several generations now, and it’s far better than the first version that made the word “iDrive” generate a reflexive winch. There’s still a multi-function control knob on the console, but most simple adjustments can be made through a power/volume knob and eight programmable buttons that are within easy reach on the dash. Climate controls have a rotary temperature knob but tedious repetitive-step pushbuttons for mode and fan speed. One control element I’ve always disliked on BMWs is the dash-mounted door-unlock button, which nearly every other manufacturer puts on the door itself, where it should be. The rear seat backs fold nearly flat with the cargo floor, and are split into three sections, providing all sorts of cargo/seating flexibility. Passenger space is about as expected of a compact car, with decent room for four adults. Tall drivers can push the seat far back for loads of legroom, though that effectively erases legroom in the seat behind them. Another thing tall drivers might appreciate is the manually extendable thigh-support cushion. What they might not appreciate are the rather tidy door openings. BMW has long held the coveted sport-sedan crown, at least in terms of image. This 328d wagon does a reasonable job of supporting that, with the additional draw of greater utility and much-improved fuel economy. While the 50 grand asked for our tester can buy a lot of different cars (and that price includes some rather expensive options we could really have done without), it’s hard to image it buying one that demonstrates a better balance of performance, utility, and green-car consciousness. Our test car hits all but one of my magic-car hot points. This charming BMW is German, a wagon, a diesel, and uses all four wheels to get power to the pavement. Had the car come with manual transmission, I would have had to have stolen it, because it’s a little out of my price range. That said, there’s not much here to dislike. The diesel is decidedly sporty in sound and power delivery, the handling is as expected of any 3-Series BMW, and the wagon configuration makes this car positively practical. As a big guy, I continue to bemoan the small door opening on 4-door compact BMWs, much as I note the same issue on Lexus IS models. The real question here is whether or not the BMW is worth $20,000-25,000 more than a Volkswagen TDI Sportwagen. I would argue it is, but only to shoppers who genuinely appreciate what you get for the extra money. 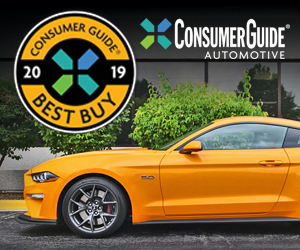 Written by: The Daily Drive staff on May 28, 2014.on February 25, 2019.